BITMAPS 93: Beatles vs Guitar Hero 5 – Fight! Austin is a strange city – a slogan and imperative proudly displayed on the back of many t-shirts there. The burg seems hell-bent on quirky and cultural exhibition, explicitly featuring that which should be implicit with human existence. This is mostly appreciated; my yearly trips to the Austin Game Developer’s Conference accompany stops in odd diners and arcades, though at times the city’s broadcasted oddities can reach the annoying timbre of a fiercely non-conformist, rebellious teenager. Look how I am both weird and from Austin! LOOK! Dallas, my perennial roosting ground, features a different tone. Here, culture is entirely incidental to business. Tall buildings line the city’s popular highways, while art districts are constantly sacrificed to the growth of urban sprawl. Established cultural centers like the Dallas Museum of Art or the Meyerson Symphony Orchestra fight uphill battles to stay alive (as their constant harassment for donation can attest), while more underground musical venues and street murals stand forever on the precipice of destruction, all for the sake of a new DART station. These different takes on city culture are analogous to Neversoft’s and Harmonix’s annual music game entries, Guitar Hero 5 and The Beatles: Rock Band respectively. Neversoft takes the Dallas approach regards game design, prioritizing sound mechanics and traditional challenge over other concerns. Their focus is to make a video game and the rest is merely overhead. Conversely, Harmonix produces work intensely respectful of music culture. Their games are mechanically solid, but at the same time feature the compulsions of those that love music so intensely that they can’t help but go the extra mile to show it. The games’ visual aesthetics reflect these approaches. Guitar Hero’s art style is more or less defined by a lack of one. Odd doodles and rough sketches lining the game’s menus and loading screens imitate the scribbles of a bored student’s notebook or a college bathroom wall. The Beatles: Rock Band’s visual style is far more unified, boasting a pastel mix of traditional 60s hippie icons and Maharishi-esque eastern flourishes. The feelings inspired by these visual cues are altogether fitting. Guitar Hero 5 is a high school mix tape recorded from the local pop radio station while The Beatles: Rock Band is the expertly decorated basement, boasting a working record player and a stack of vintage vinyl. You’ve got 2112?! NO WAY MAN! This trend continues with the user interfaces. Guitar Hero’s UI is far more traditional, featuring a smattering of meters, dials, and gauges that are tacked together with a minimum of visual grace. World Tour’s in-game UI was laughably disconnected, featuring a floating score and rock meter in the upper left and a multiplier indicator that protruded uncomfortably to the right of every lane of notes. Star Power and life meters are squeezed in to where they’lll fit, with minimum consideration paid to usability and visual cleanliness. Contrastingly, Rock Band 2 slickly integrates overdrive meters and combo indicators to the lane tracks, giving the game a much more integrated feel. The capstone of the two approaches can be seen in their treatment of the single band. Guitar Hero was first out of the gate in this regard, releasing Guitar Hero: Aerosmith over a year ago. The game featured songs from the band, their motion-captured digital likeness, venues from their past, and even interviews with the group (though they were edited for the attention deficit). This struck many as a bare minimum of effort for a full price product, even without Harmonix’s superlative work to compare it against. What’s more, Guitar Hero 5 boasts the digital likenesses of Johnny Cash and Kurt Kobain, two musician’s whose anti-establishment streaks would probably send them into a rage were they still alive to see this happen (though Courtney Love has responded in typical Courtney Love fashion). Harmonix’s offering would be exemplary even without these half-hearted offerings to distinguish it. The game is intensely, almost rabidly devoted to expressing the significance of The Beatles’ musical and cultural impact. The game chronicles The Beatles’ growth as a band both visually and musically, offering surreal visualizations in increasing proportion to lengthy sideburns. Additional content like candid photographs show the band’s character, while liner notes reveal interesting and yet-unknown bits of trivia about some of the band’s work. Even though the game tends more toward artistic liberty than historic reality at times (there’s no Lennon throwing a hissy fit minigame), The Beatles: Rock Band sets a new standard for band-focused music games. 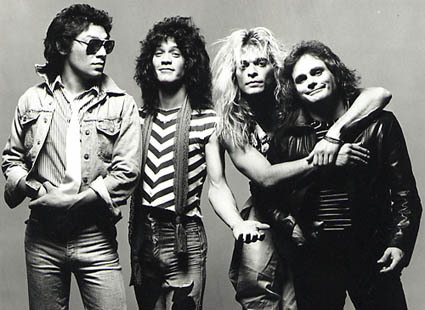 Expect big things from Guitar Hero: Van Halen. Big things. And yet, the mechanical additions of Guitar Hero 5 can’t be marginalized. As awesome as it is to nail a harmony on "Day Tripper", nothing compliments a party like Guitar Hero 5’s Party Mode, allowing players to jump in and out of songs at will. For all the musical respect in Harmonix’s work, there’s respective enjoyment in hearing a man drunkenly scream “I LOVE THAT SONG” and then trip over the coffee table in an attempt to play "Dancing with Myself". As one who freely admits to musical snobbery can attest, it can be hard to see so many gamers opt for a franchise that doesn’t pay music the intense respect that Harmonix does. However, not everyone is a music snob, nor does everyone need to be (imagine what that’d do to the hipster scarf market).